"We have not had one major terrorist attack in this country after 2014," she said. "There are of course disturbances on the border," she went on, "but the Indian Army has made sure that every attempt to come into this country is eliminated even at the border." The remarks have proved controversial, provoking discussion over what constitutes a "major" attack, given the large number of incidents that have taken place. "Will the defence minister take the map of India and locate Pathankot and Uri?" tweeted P Chidambaram, former finance minister from the main opposition Congress party. Seven Indian soldiers and six militants were killed in an attack on a base in Pathankot in Punjab state in January that year, blamed on a Pakistan-based group. Four gunmen attacked the army base at Uri in Indian-administered Kashmir in September, killing 17 soldiers. According to the government's own data, presented to parliament by the home affairs ministry, there was a "major terrorist attack in the hinterland" in both 2015 and 2016. "There's no policy statement or government release where the difference between a major or minor attack has been defined clearly," according to defence expert Ajai Shukla. "It's a matter of perception," he says. "It depends on intangible factors such as the importance of the target, the origin and outcome of the attack and its symbolic value." The BBC has sought clarification from the Indian government, pointing out that its own documents refer to "major" terror incidents, but has not received a response at the time of writing this article. One non-governmental group, the South Asian Terrorism Portal (SATP), provides its own definition of a major attack. It calls any incident with three or more fatalities - civilian or military - a major attack. According to SATP, there were 388 "major" incidents in India from 2014 to 2018 using their definition. It's helpful to look at how insurgent and militant attacks have changed over time, comparing the situation under the current government with that under the previous administration. From 2009 to 2013, when a Congress-led government was in power, government records show 15 "major cases of terrorist incidents in the hinterland" - significantly more than under the current government. 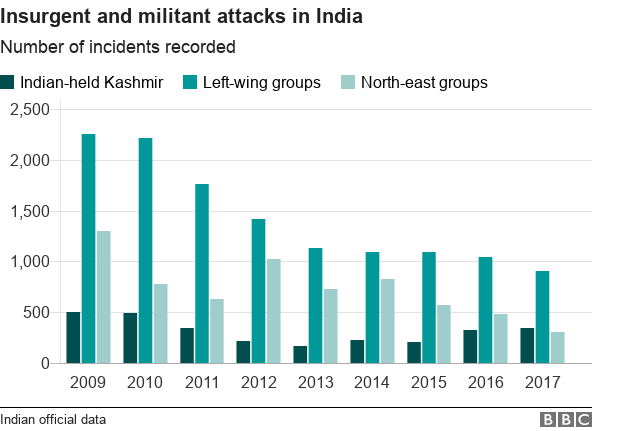 But incidents in Indian-administered Kashmir, which were showing a steady decline from 2009 to 2014, have been on the rise under the current government. And in 2018, Indian-controlled Kashmir saw the highest fatalities in terror-related violence in a decade with 451 deaths, according to SATP's Ajai Sahni. In the north-eastern part of the country, except for a spike in 2012, there have been fewer and fewer reports of violent incidents - and a sharp fall in civilian deaths since 2015, according to official data. The region has seen ethnic and separatist conflicts for decades, involving a variety of groups fighting for local autonomy or complete independence. When it comes to left-wing insurgent groups in the country, Prime Minister Narendra Modi has compared his government's track record favourably to the previous Congress-led administration. Mr Modi told the Swarajya magazine in July 2018: "Maoist violence has declined by 20% in the affected states with a concomitant reduction of 34% in deaths in 2017 compared to 2013." Mr Modi's figures about the decrease in fatalities match the official tally. But according to the Home Affairs Ministry's own reports, the declining trend in this type of insurgency actually began in 2011 under the previous government.